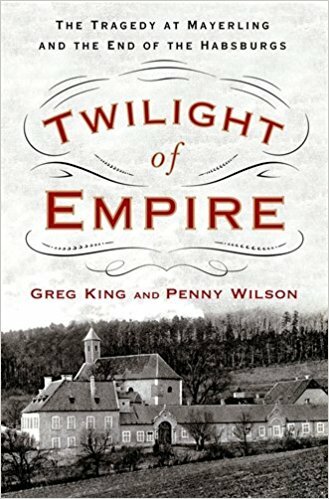 I am clapping my hands in approbation of Greg King and Penny Wilson's masterful study Twilight of Empire (St. Martin's Press: $27.99). Why? 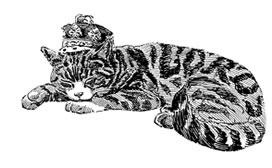 Well, the authors have carefully and meticulously -- and indeed judiciously -- taken apart, examined (and re-examined) the events that led to Mayerling, where Archduke Rudolf, heir apparent to Austro-Hungarian throne, and his mistress, the young Marie Vetsera. Mayerling has inspired biographers, historians, filmmakers and others, leading to a myriad of accounts - some accurate and some not. Rumors lead to whispers which lead to more rumors. King and Wilson take their time in presenting the denouement. Archduke Rudolf was the only son of Emperor Franz Joseph and Empress Elisabeth. It is suffice to say that Rudolf's childhood was tarnished by parental indifference, bad tutors, and far too many opportunities to fall down the rabbit hole. A marriage was arranged with Princess Stephanie of Belgium, daughter of King Leopold II. Stephanie's sister, Louise, was married to Prince Philipp of Saxe-Coburg and Gotha, was one of Rudolf's closest friends. Politics also plays a role in the final chapter as Rudolf, whose liberal leanings and concern for Hungary led to conflict with his father, who preferred a more iron hand. Unfortunately, for Rudolf, he suffered from far too many ailments, physical and mental, and he was wreaked by so many health issues. He contracted gonorrhea, which he transmitted to his wife, rendering her sterile. The couple had one daughter, Elisabeth, but no son. Rudolf and Stephanie were ill-matched and she was unable to provide emotional support to her husband. Her in-laws considered her useless as well. Rudolf had many lovers, but the most infamous is, of course, Marie Vetsera, a teenager girl from a minor noble family. She and her mother were ambitious, to say the least. Marie lived in a fantasy world, believing that Rudolf would marry her. Twilight of Empire is divided into four sections. The first section sets the scene: events leading up to January 28, 1889. In the second section, the authors provide a "straightforward account of the tragedy" and the immediate aftermath. The third section focuses on the conspiracy theories that have plagued historians and biographies for more than 100 years. In the final section, the authors provide the context and set the tone for the facts of what happened in the wee hours of January 30. The authors have given readers a compelling and well-grounded study that shines a light (not always a new light) on the Mayerling. This is not one story or one fact, but many stories that have multi-levels, and King and Wilson have stripped away each level with careful examination, before putting the levels back again, this time arranged in a fluid yet precise manner. 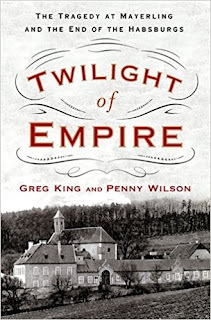 There are some facts we will never know ... unless Count Taafe's files are found -- but King and Wilson have written a compelling book that will stand for some time as the standard for the events that led to Mayerling, the events at Mayerling and the aftermath. Twilight of Empire is a compelling read. Take the time to read it, to digest all that the authors have provided. When you have put the book down after the first turning the final page, you will understand, appreciate and respect the work of true historians. Wonderful review. I just recently purchased this book and have started reading and it definitely is holding my attention. Thank you for this review. I did not know about this book, but will read it as soon as possible. It is sad that the Hapsburgs do not receive the attention the level of their historical importance would entitle them.